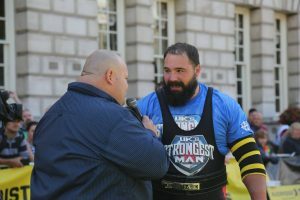 Ben Brunning has dominated the Welsh Strongman circuit for the past two years – winning his second Wales Strongest Man in March 2018. This impressive win gained him qualification to the UK’s Strongest Man Finals where he will face the best in the UK with the likes of Laurence Shahlaei and Tom Stoltman firm favourites. Ben has made fast progress in the sport. In 2017, a bigger and meaner Badger got to the Semi Finals of UK’s Strongest Man. His goal will be to make the 2018 UK’s Strongest Man final. Ben is known as “Badger”, and works as an outdoor sports trainer in Wales. His permanent smile and good humour make him a favourite with his fellow athletes and fans alike. To see Ben compete in UK’s Strongest Man 2018 book your tickets now on ultimatestrongman.tv or at www.eventbrite.co.uk.